Urinary and kidney disorders are often recurrent in cats due to age or genetic predisposition. 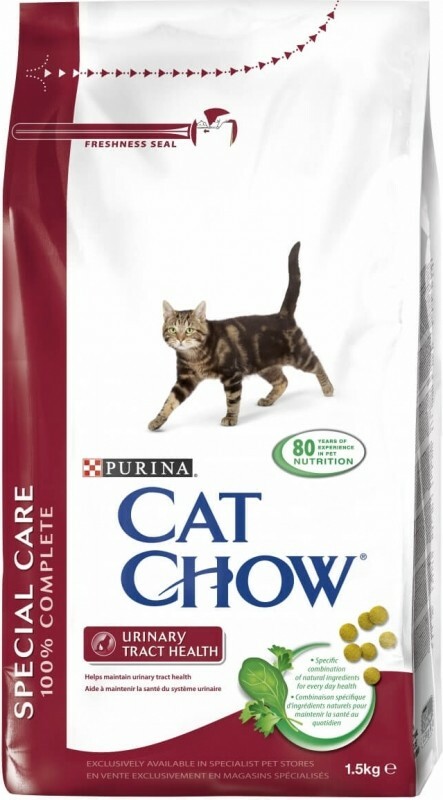 Purina Cat Chow Adult Special Care Urinary System has been developed to preserve the health of your pet's urinary system. Made high quality ingredients including chicken, this cat food is formulated to regulate the urine pH and provides less dietary magnesium. Protein 34%, fat 12% crude ash 8% crude fibre 3%, calcium 1.3% phosphorus 1.3%. Cereals, meat and animal by-products, plant protein extracts (soy min. 2%), oils and fats (rosemary extracts min. 0.006%), fish and fish by-products (salmon min. 4%, tuna min . 4%), by-products of plant origin (rapeseed meal min. 0.05%), vegetables (carrots min. 0.5%, spinach min. 0.5%, parsley min. 0.2% chicory min. 0.5%), minerals, yeast. Vit A: 16 900; Vit D3: 1400; Vit E: 120; mg / kg Fe (E1): 60; I [E2]: 2.1; Cu [E4]: 12 Mn [E5]: 6; Zn [E6]: 90; If [E8]: 0.14.